A quiet change in the privacy setting of its forthcoming iOS 8 smartphone Operating System, Apple could effectively block the path for advertisers, marketers, and other snoopers looking to collect data about you and your location from your Smartphone devices. When your mobile device scan for a free Wi-Fi network, whether at the shopping complex, airport, or restaurant, it sends out the MAC address which is a unique identifier of the device that allows devices to distinguish between one another on a network. Routers need this identifier to connect you to a network. Advertisers and retailers have been seeking to track these identifiers to help offer personalized advertisements to customers based on where they’ve been. Thanks to Apple’s upcoming feature which will enhance users privacy to one step higher than other smartphone providers. Apple announced the change during its annual Worldwide Developers Conference (WWDC) in Cupertino last week, revealing that the feature will restrict the information your device will share when it will scan for near-by wi-fi networks. To do this, the device will spoof MAC addresses that it broadcast to the all available wi-fi network when device searches for them. 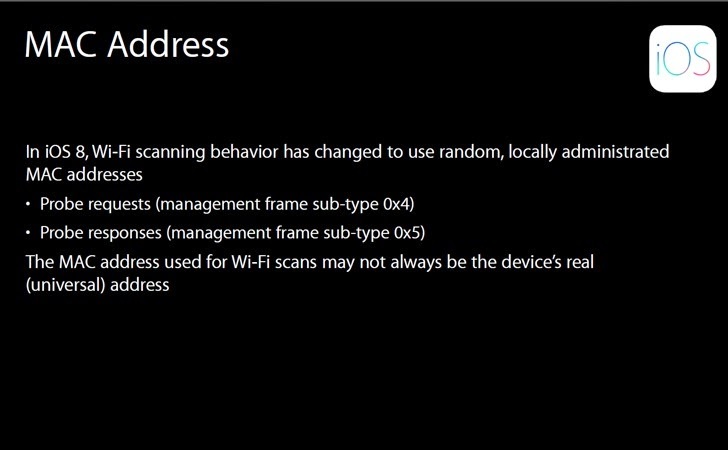 “In iOS 8, Wi-Fi scanning behavior has changed to use random, locally administrated MAC addresses,” Apple notes. This exactly means that “the MAC address used for Wi-Fi scans may not always be the device’s real (universal) address,” Apple explains. Not only this, to enhance iOS 8 users’ privacy, Apple has also added Secure Search Engine DuckDuckGo as the default search engine in Safari. DuckDuckGo claims that when you click on one of their search results, they do not send personally identifiable information along with your request to the third party. iOS 8 Safari Browser also has Camera based Credit Card scanner to fill up the debit and credit card details automatically on payment pages, rather than filling them manually into the browser.